Like many of you, I’ve been collecting retro gaming stuff for years now. I haven’t written much about my collection on this blog, so I thought I’d better get started today. 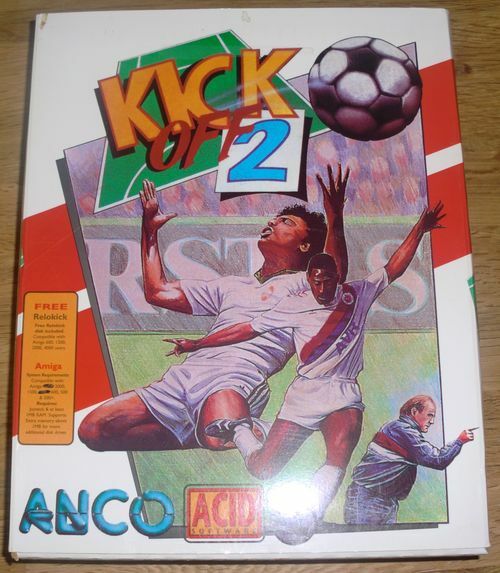 The first item I want to show you is my original copy of Kick Off 2 for the Amiga. This legendary football game is still played today by people all around the world. There are even tournaments being held! Isn’t that amazing? Who would have thought that this old sports game would be so popular today? I wouldn’t. 😉 It truly shows how important gameplay is when it comes to the lastability of a game. As you can see from the photos, this is not the first edition of the game. The first version came in 1990, while this one was released a few years later on. It is interesting to note that the box says it comes with a free Relokick disk for Amiga 1200 users. 🙂 This is because the game isn’t really compatible with either the Amiga 1200 or 4000. Previous Website: Felt Sew Good – Retro Themed Cushions! I’ve got quite a few original games in my collection. Some of those I cherish the most are Monkey Island, Indiana Jones & The Last Crusade, Gloom, Pinball Dreams and Simon the Sorcerer. Do you collect original games? I saw that advert the other day. Seems like he got them directly from a company that have stopped selling Amiga stuff or just closed shop. The items is probably of high quality, still sealed. The games are probably quite expensive though.. I don’t collect originals, it takes up too much space. I have a few of them, but I intend to sell them as soon as possible. Last time I checked, he asked for 100 kr per game. You can probably get them a lot cheaper if you buy the whole lot. 🙂 Wasn’t it something like 100 NIB games? Are you going to sell your games on Finn.no, QXL or somewhere else? To me it seems like Finn.no is taking a lot of customers away from QXL at the moment. How’s your hardware situation btw? Are you going AGA? I will sell the games (and all the other stuff I’m selling) on Finn. I feel like QXL is dying. I wonder if they just priced themselves out of the market, or if Finn’s massive marketing campaign a couple of years ago made them the defacto standard site for selling used goods on the Norwegian market. I’m definitely not selling anything on QXL ever again, but I may buy stuff from there. The prices are good for buyers, because no-one is bidding..
Might be worth a shot, but I don’t think I can justify such a purchase. 😉 Wouldn’t mind getting Xenon 2 and Railroad Tycoon though. Seems like he has sold some of the items now. I’ve got the same impression concerning QXL. Doesn’t seem like there is much bidding there anymore, which is quite different from the situation a few years ago. Then there was bidding all over the place! Lot’s of Amiga stuff for sale as well, but now there isn’t much to find. Please don’t tempt me with that Amiga 4000.. hehe.. 😉 I’d love to own a 4000, as it has been a dream of mine for many years. It all depends on the price though. Maybe we could work out some kind of deal? If you’re going the A1200 route, I might have some hardware to trade. Thanks for commenting. 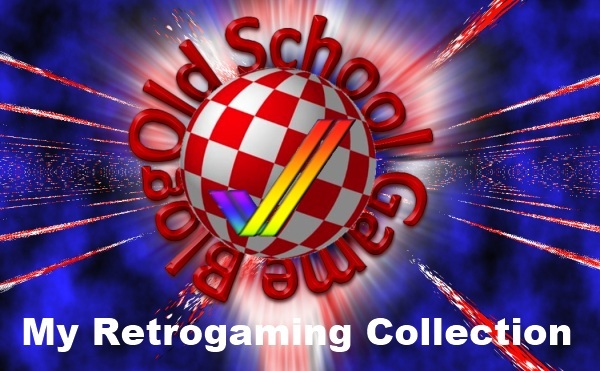 🙂 Are you a collector of Amiga games? Would love to read more about your stuff. I wish I had a lot of the games from my previous consoles in my collection. Right now the only things left over are my Final Fantasy games from PS1 (which I still play), one NES Cartridge, a couple of SNES cartridges, and a bunch of CD-Roms that I can no longer play. Yeah,especially if they are games you really enjoyed. Before they released the first two Shining Force games on the Sonic’s Genesis Collection, the actual Genesis cartridges were too expensive to even want to spend the money. Nice logo! Very thoughtful to have included the relokick for compatibility. I very much remember the headaches between the generations of chipset which was quite frustrating having established a large library of originals prior to release of these ‘newer’ models. I even tried returning my A500+ back to the retailer when it was first released as this was such a huge problem – In time I came to appreciated each for their refinements, respecting their capabilities and acknowledged Commodore’s technological strives. I remember the compatibility problems when the Amiga 500+ was released. A friend of mine got one and he became frustrated since he couldn’t play all the games he wanted. I never really got into Kick Off, I suppose it was due to still having a Speccy at the time. 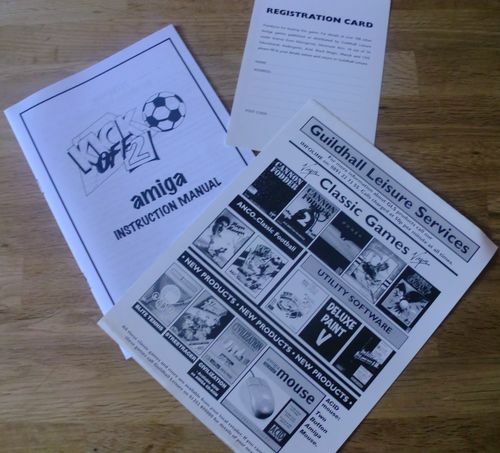 When I did get my Amiga I got more into Sensible Soccer so Kick Off never really got a look in. Good times though! Are there any good football games for the Spectrum by the way? Sensible Soccer was awesome. I remember we liked the fact the names of the players and clubs were real. The manager mode that they implemented was also quite cool. Matchday II was fun as was Microprose Soccer (which is in my upcoming blog post). Sensi was amazing, and yeah with Sensible World of Soccer the manager mode was fun and really added to it. Had some epic games and home made tournaments with my mate on Kickoff 2, although we were more into Sensible Soccer. Hehe.. that’s a good idea! Would be a lot of fun, but I doubt they still are on that address. 😀 Wonder what Guildhall is up to these days! Pinball Dreams is epic. What was your favourite table? I have a soft spot for Beat Box and Steel Wheel. Seems like a lot of folks favour Sensible Soccer over Kick Off. I can understand that. You’ve got a lot of more options and possibilities in Sensi. The Nightmare level was quite cool when I think of it. Spooky music and sound effects. 🙂 Did you play Pinball Fantasies as well? Cool! How do you think it compares to Sensible Soccer? I prefer Kick Off 2. Maybe since I played that one first. 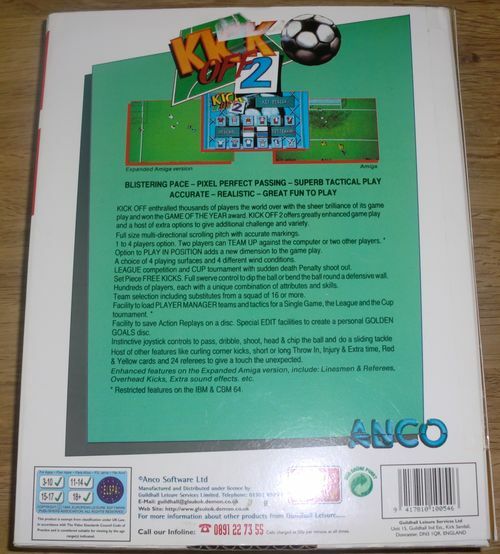 But I also played Sensible Soccer a lot but I never got that feeling I got with Kick Off 2. How about you? Nostalgia is a great force indeed. 😉 I prefer Sensible Soccer due to the large amount of options, players and teams. Still, Kick Off 2 will always have a special place in my heart. I think I will give all the football games out there a try. I see a lot I never tried. Would be fun to read, especially if you include some of the bad games.. hehe.. Kick Off peeked at version 2 and every thing that came after it was well rubbish. Hehe.. looking forward to the reviews mate! 😀 I’m especially eager to read about that vector soccer game. Is there anyway I can play KO2 on my MacBook, iphone or iPad?